Someone else said these are like peppercinis. I made some of these last fall, since for the first time in my life I had peppers that grew and produced well! The bell peppers still were pretty much a failure, but the banana peppers did awesome for me. We’ve enjoyed some banana peppers on subs, so I searched around to find a recipe to make our own. This is what I found, but I also added a bit of crushed red pepper, since these were not HOT banana peppers, and we don’t like them quite that hot, anyhow. This originated at the Taste of Home Forum if you want to see the original thread. The flavor of these was very good. We made some with and some without the crushed red pepper and found the flavor with it to be much better. But I think the crushed red pepper does something that causes the peppers to soften a bit, so the texture eating straight from the can is a bit mushy (but fine in sandwiches). Remember to multiply the ingredients above by the number of pint jars you plan to can. I put my (washed/sterilized) jars in a tub partially filled with hot water to warm the jars and prevent any cracked jars from thermal shock. 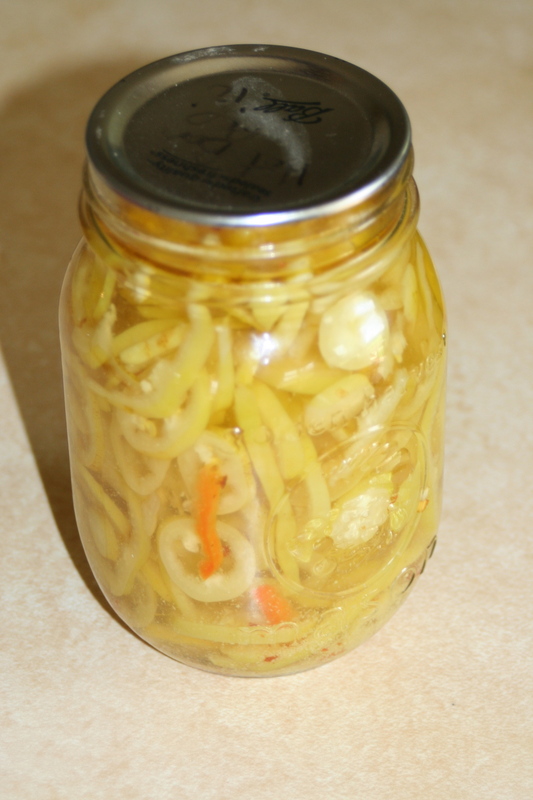 Fill your jar with sliced banana peppers. Add the garlic, salt, oil, and crushed red pepper right into the pint jar with the peppers. Pour the boiled sugar/vinegar/water mixture over the peppers and fill to 1/4 inch from the top of the can. If you’re short on liquid, add equal parts vinegar and water to finish filling the jar. (Make sure you get some of the boiled sugar mixture into each of the jars before you fill all of them all the way to the top!) Wipe rims, put on hot lids and screw bands on. Since these are “pickled”, they can be hot water bath canned. Process (boil) 10 minutes. FYI, this recipe is not interchangeable using bell peppers. I tried a can to fill the canner, and they were disgusting! 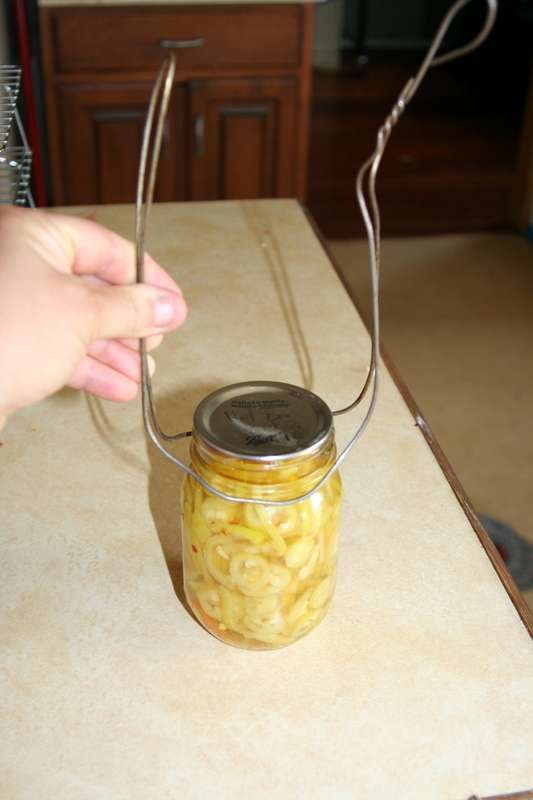 I do enough canning that I just need to get a REAL can lifter. It would work better, but (sigh) I’m still too cheap and busy. Some day. I made this to use after soaking several hot mitts and trying to dump or dip extra boiling water out of a large canner so that I could get cans out. It’s been serving me well- much better than the mitts and ladle, anyhow. I found it somewhere, either online or in a book. But I can’t find it again, other than a simple description, and I know how hard it is to make something you haven’t seen! Here’s the visual of the end result. Take a metal coat hanger and flatten it- the opposite direction of how it’s normally shaped. Then put the bends in so there’s a “handle” on each side to grip. Round the center slightly to go around the round jar tops. Practice lifting a few jars before you try it full of steaming hot food! I haven’t dropped anything yet (and had it break), but I have lost a can back into the hot water, because I didn’t have the can properly inside of the wire. 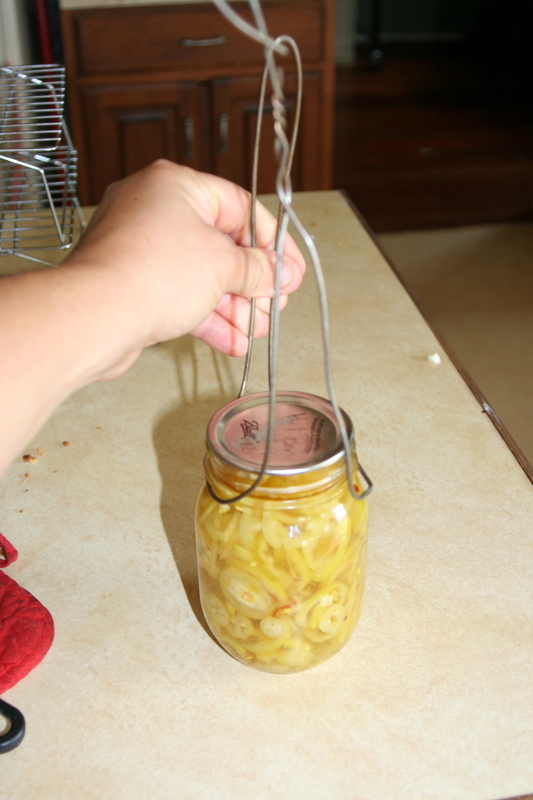 Make sure when using this that you get the wire under the glass rim and securely grip both sides to lift cans. We’ve enjoyed this recipe so much since we’ve started to use it. We had it again a couple days ago and I decided it needed to be shared in a post. I’m not a big fish person, but this I really like. It’s better than any fish fry we’ve ever had eating out. I use the recipe for Crispy Fried Chicken from the “American Classics” Cookbook as my starting place for basic ingredients and technique. Take 4-6 TIlapia Fillets (fresh or thawed). I use the 4 oz. size. Coat with DRY flour mix first, then in liquid, then back in the dry for an outer coating. It gets a bit goopy (I just use my hands) going from liquid to dry, but it’s SOOO worth it! Put into pre-heated oil to fry. I use an electric skillet, as I can’t regulate the temp reliably in a pan on my propane stove. I set it to 375. Fry bottom to golden brown, flip over to finish frying. It will flake apart inside when it’s fully cooked. It doesn’t take more than 10 minutes to fry, maybe less (If I recall correctly). For more (up to about 12 fillets): Make more coating and add a bit more milk, fry in multiple batches. Drain and serve or keep warm in a low oven while you’re finishing the rest. I ran across this the other day and gave it a try this morning. It worked great, and you don’t have to remember to set aside eggs to be able to use them for hard boiled. It’s at the Highland view pantry and I’ll definitely be doing my hard boiled eggs (Fresh) this way from now on! You steam them for 30 minutes instead of boiling them in the water.